Would you like to be more attuned to your own experiencing and to those you live and work with? Would you like to learn an embodied and relational approach to unwinding stress and trauma? Focusing is a process of inward bodily listening that allows for healing the most painful wounds and discovering our unique gifts. 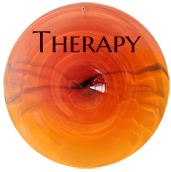 Focusing-Oriented Therapy is a body centered and relational process that helps therapists keep clients safe and regulated while unwinding chronically stuck and traumatic experiences. In this two day workshop, I will teach you the basic steps of Focusing so you can practice with a partner and bring Focusing into your life and healing practice. You will gain access to the rich inner wisdom that unfolds as you find Presence in your own life, and then how to facilitate a Focusing-Oriented approach to healing with others. After completing the first workshop, you can continue your learning through more workshops to complete the first year of the program. These workshops will help you expand your skills, deepen your experience, and ground your practice of Focusing. The goal of these workshops is to help you build a solid foundation of Focusing skills and experience so you can bring this unique skill set into your practice with others. I look forward to sharing this journey of self discovery and transformational healing with you! FOT-1: $345.00 for early or $395 for standard registration. FOT-2 through 5: $395.00 for registration when paying for individual workshops. All workshops are approved for 12 continuing education units. All mindfulness and focusing skills are practiced during the workshops so you can learn experientially. Each workshop comes with a manual, supporting materials for your learning and a recommended reading list. 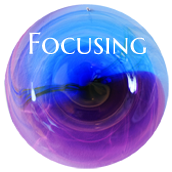 You will learn how to incorporate these exciting new Focusing skills in your personal life and your professional practice. Focusing partnerships form during each workshop as a way of practicing and deepening your experience and skill building. After you have completed the five Focusing workshops, you are eligible to take my Focusing for Complex Trauma Training. What Makes This Focusing Training Unique? 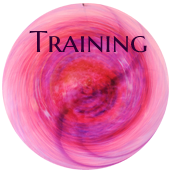 This Focusing training is not your typical continuing education for healing professionals! Instead of teaching you a technique to do to someone, Focusing training reveals a naturally occurring, innately powerful, self-healing process. Learning Focusing is psychological and philosophical, and touches spiritual edges as it takes you deep into your own experiencing. 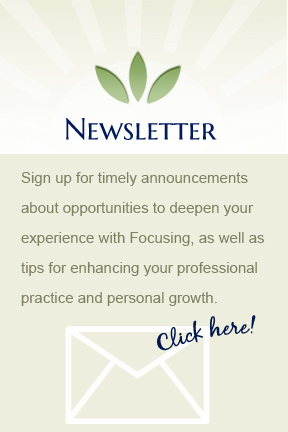 A core value of this training is developing you – the healing professional – and how you incorporate your personal Focusing process into your healing practice with others. Throughout this workshop series, you will continually ground your experience in a widening sense of your authenticity. You will become attuned to your body’s way of communicating your personal truth about situations. Diving further into your own experiencing, a new understanding of what is meant by the body emerges, a situational body as experienced from the inside, interacting with its environment. With this Focusing training and practice through partner exchanges, you will discover your own experiencing process, how it gets blocked, and how Focusing can continually illuminate the path to your own healing and growth. With a little time and experience you will gain clarity about how to integrate Focusing into your life and work. For healing professionals who want to use Focusing in their work, ongoing support and learning is available on an individual basis and in small learning groups. Feel free to contact me with questions.